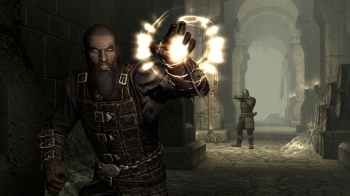 A new course studies Scandinavian lore through the latest Elder Scrolls entry. I don't know about you, but once I got through the prerequisites for my major, I took some pretty cool courses in college: Mammalian Evolution, Environmental Ethics, even Intro to Video Game Design. My school didn't offer anything like what Rice University has planned for next semester, though. The prestigious Texas institution will teach a course entitled "Scandinavian Fantasy Worlds: Old Norse Sagas and Skyrim" through its English department, which will explore the folklore, myth, and literature of Northern Europe through the lens of the hit Elder Scrolls game. Professor Donna Beth Ellard will be taking charge of the semester-long endeavor. "[Students] will read selections from Old Norse and Old Icelandic sagas (in translation) as they play different quests within Skyrim," she writes in the course description. Ellard's students will cover a wide breadth of topics during the semester, including the psychology behind "fantasy" in gamer culture, the political struggle in Skyrim and what it represents, and how Scandinavian myth shaped modern Anglo-American fantasy. "The purpose of establishing these connections is to then consider how elements of medieval Scandinavian culture have been taken out of historical milieu and literary context," Ellard explains, "morphed into unfamiliar shape, and appropriated towards other fantastic pursuits." Videogames and academic pursuits are already familiar bedfellows when it comes to technology, entertainment, economics, and sociology. However, this may mark the first time that a major university has used videogames to analyze literature in an academic setting, at least on this side of the Pacific. If you're at Rice and sign up for this course, just remember that the course's primary thrust is still reading literature. Too much time spent playing Skyrim and not enough doing coursework might upset the professor, and we all know what happens when academics shout "fus ro dah!"